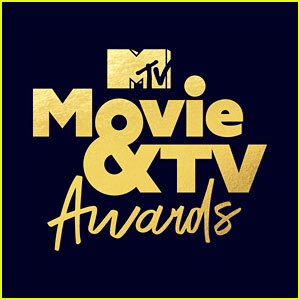 MTV Movie & TV Awards 2018 - Complete Winners List! The fans got to determine the winners at the 2018 MTV Movie & TV Awards and you can check out the full list of winners right here! Black Panther was the big winner in the movie categories, taking home Best Movie and three other awards. Stranger Things dominated the television categories with three awards, including Best Show. Tiffany Haddish hosted the show and she inserted herself into several big movies, including Black Panther and Star Wars, during hilarious sketches that aired throughout the night. Millie Bobby Brown is speaking out in response to the online bullies who led her to delete her Twitter account last week. 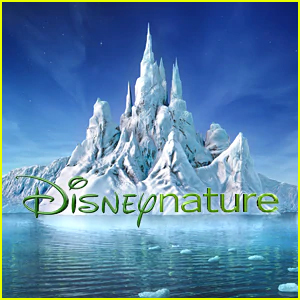 The 14-year-old actress won the award for Best Performance in a Show and accepted the prize in a video-taped speech, which aired at the 2018 MTV Movie & TV Awards on Monday night (June 18) on MTV. Millie was unable to attend the event after splitting her kneecap the other day. Bad Moms' Mila Kunis & Kristen Bell Reunite at MTV Movie & TV Awards 2018! Kristen Bell and Mila Kunis have a Bad Moms reunion at the 2018 MTV Movie & TV Awards! The 37-year-old Frozen actress and the 34-year-old That ’70s Show star teamed up for the event, which was taped on Saturday (June 16) at Barker Hangar in Santa Monica, Calif.
Kristen stunned in a black cut-out dress, while Mila rocked a white shirt with red and white pants. Mila took the stage alongside Michael B. Jordan as a presenter, while Kristen presented with Seth Rogen. Be sure to check out pics of Kristen on the red carpet here! FYI: Kristen is wearing a Julien Macdonald dress, Charlotte Olympia shoes, and Tiffany & Co. earrings. 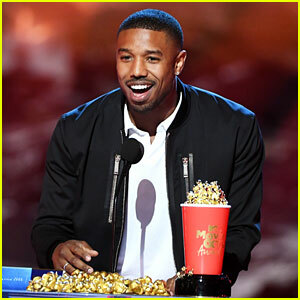 Michael B. Jordan is all smiles while accepting the award for Best Villain at the 2018 MTV Movie & TV Awards, which was taped on Saturday (June 16) at Barker Hangar in Santa Monica, Calif. The 31-year-old actor threw some shade at Roseanne Barr while give his speech. “I’m shocked that I won this award for Best Villain. I thought Roseanne had this in the bag,” he quipped after walking on stage. Michael won the award for playing Erik Killmonger in the movie Black Panther. His co-star Chadwick Boseman picked up the award for Best Hero! 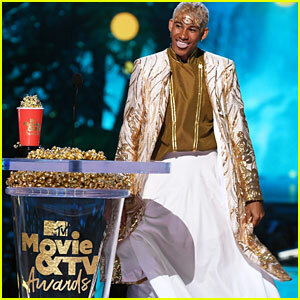 Keiynan Lonsdale appears on stage to accept the award for Best Kiss at the 2018 MTV Movie & TV Awards, which was taped on Saturday (June 16) at Barker Hangar in Santa Monica, Calif. The 26-year-old actor won the award alongside Nick Robinson for their kiss at the end of the movie Love Simon. Chadwick Boseman Gives His MTV Award for Best Hero to a Real-Life Hero! 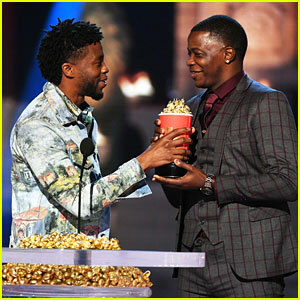 Chadwick Boseman just handed over his award for Best Hero to real-life hero James Shaw Jr.! The 40-year-old Black Panther actor called the shooting survivor up on stage at the 2018 MTV Movie & TV Awards, which was taped on Saturday (June 16) at Barker Hangar in Santa Monica, Calif.
James disarmed a gunman at a shooting at Waffle House back in April. “Receiving an award for playing a superhero is amazing, but it’s even greater to acknowledge the heroes we have in real life,” Chadwick said. Watch the moment below!